Fully sheeting up and sealing the hearth opening and surrounding floor area. Having sized the flue and chosen the correct brush size, passing this brush the entire length of the flue, twice, and if an open chimney pot, observing the brush exiting the pot. Performing a smoke evacuation check. Removal of soot from property and the cleaning up of the hearth area. NACS/HETAS Certificate issued on the successful completion of the sweep. Equipment used - Nice clean floor sheets, a sheet to seal the fireplace opening, traditional rods and brushes and a specialist vacuum cleaner. This starts with our standard Gold Service (as above and obviously included in the £99). If appropriate we will conduct a Mechanical Power Sweep using a RodTech Power System. (This will not be carried out if we have concerns over the structural integrity of the flue). A CCTV Camera Survey of the internals of the flue. An integrity test. 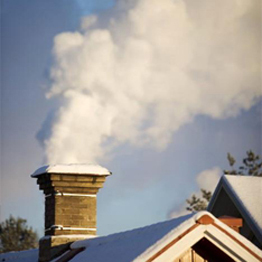 ( The chimney pot and hearth opening are sealed and smoke is pumped into the flue under pressure. 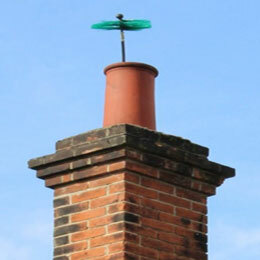 The entire length of the flue is then inspected, both internally and externally, for leakage. Providing there are no safety issues, we will issue an official, fully recognised NACS/HETAS certificate on completion of either the Standard Gold or Platinum Service. We also take pride in offering an honest, courteous, old fasioned service whilst utilising modern techniques and equipment. If the birds have been busy in your stack then it is highly likely that our Nest Removal service will be required. This is charged at £80 per hour (which includes a Gold Service Sweep). As a guide, we aim to clear a nest within an hour, occasionally it may take two hours. Please note the room pictured was left absolutely spotless after this nest was removed! 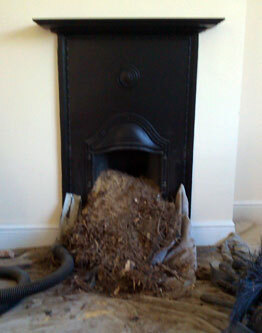 For a really caked up chimney we recommend our Power Sweeping service. 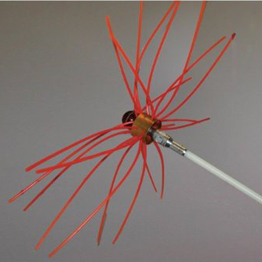 An electrically powered rotating flail system, this encompassess all of the benefits of a standard Chimney Sweep using rods and brushes but with the advantages of removing tar and creosote as well as soot. A Smoke Evacuation Check is carried out as standard as part of the Gold Service and is included in the fee. On completion of sweeping a lighted smoke pellet is placed in the hearth in order to check that the flue is drawing. Customers should be aware that atmospheric conditions may change from day to day, however we are always very happy to discuss any anomalies and how to improve the draw of your fireplace. If there are issues regarding the integrity of the flue, for example neighbours complaining of smells, or a request from a building surveyor, we can carry out a Full Integrity Test. This test involves sealing off the terminal, pressurising the flue with smoke and then inspecting the whole flue for leaks. A requirement of this test is that we have full access to adjoining properties and loft-spaces. This test is not included as standard within the Gold Service and prices start at £30. CCTV Inspections and Surveys are an additional service for where doubts about the integrity of the chimney exist during which a camera is passed up the length of the chimney to inspect the internal surface and structure. Like a colonoscopy for your house, but without the waiting list!